d’Arbeloff concluded by explaining that despite the dire environmental trends (coupled with unstable energy prices and finite fossil fuel supplies), there will be a bright “green” future. He said this will be made possible, first, by the right policy, which will unleash innovation and free markets to solve our energy problems. The event was hosted by Goodwin Procter LLP, and organized by my high school, BB&N. A special thanks to my friend, Jonathan Shapira, author of the Cleantech Investing in Israel blog, for making it happen. I was flattered to be invited to present to the BrightTALK Green Marketing Summit tomorrow (Friday, 4/24). BrightTALK is aiming to become the “YouTube for Business,” meaning they arrange targeted meetings/summits online and then store the webcasts so people can watch them in the future (upon registration). The summit will include representatives from companies like Intel and HP, as well as green marketing experts like Joel Makower, who runs GreenBiz, among other ventures. My session, scheduled for 4 pm EST, is titled: Green Marketing: Bridging Theory & Practice – A Guide to Making Your Direct Marketing Efforts More Sustainable. To attend the summit, please click here. There will be a live Q&A session, so I will be back with a full report over the next several days. The Green Business Summit will be held on Friday, May 15, 2009. We at Grossman Marketing Group were honored and humbled this afternoon to learn that we are one of this year’s recipients of a Boston Business Journal green business award. The award will be presented at this year’s Green Business Summit, scheduled for Friday, May 15, at 7 am at the Sheraton Boston Hotel. We were included in the “Innovation” category, and recognized for our work in the green marketing and sustainability space. We are especially grateful to our client, Zipcar, for nominating us for the award. Here’s a link to learn more about the event program as well as to register. Neff points to product launch and sales data that indicate that even during the recession, consumer-packaged goods manufacturers are seeing significant revenue growth for their green offerings. In fact, according to Seventh Generation CEO Jeffrey Hollender, his company’s sales were up 50% last year and 20% in March 2009 versus March 2008. 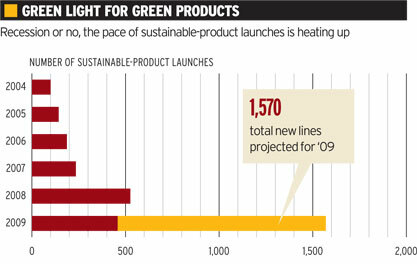 The article continues that as opposed to previous recessions, during which sales of green products “had the air taken out of them,” sales of green products have remained stable (and are still growing) in the current downturn. Neff includes some interesting tips for green marketers at the end of the article, and I would certainly recommend giving it a quick read. Here’s a link to the full article. Courtesy Wall Street Journal. Illustration by Michael Witte. 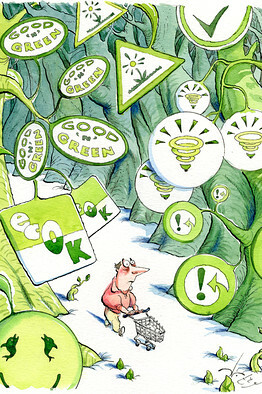 The Wall Street Journal has an interesting report in Thursday’s issue titled: “As Eco-Seals Proliferate, So Do Doubts.” The article discusses how a number of unregulated organizations that purport to verify “green” product claims have sprouted up, which only makes buying these products even more confusing for businesses and consumers. 1) The U.S. Government may need to oversee the creation of Federal green marketing standards, similar to what the U.S. Department of Agriculture has done with organic foods. 2) Eco-seals that are verified by reputable third-party organizations are more reliable. One example the writer provides is a Canadian-based organization, Ecologo. I couldn’t agree more. I have been pushing my industry and my clients to be transparent about green marketing claims, especially because consumers are smart and see through “fuzzy” and unsubstantiated claims that organizations make. This is why when a client uses eco-friendly papers in their marketing programs and wants to explain the environmental benefits derived from these choices, they should not use a paper company’s calculator to arrive at these statistics. Rather, they should use the paper calculator created by Environmental Defense, a leading non-profit dedicated to the environment. I have written about this resource a number of times over the past several years. I also believe that the Federal government should step in and begin to regulate green product claims. I know this will be a difficult process, as it would be impossible to apply the same standards across all industries. Nevertheless, it is important to start now, as it will help companies and individual consumers to better navigate the increasingly-complicated product landscape.